The Hollywood “dream factories” have always utilized themes from dreams and nightmares, and there’s no doubt in my mind that this compelling stream of screen imagery insinuates itself into our own personal dreams and nightmares. So I was riveted by a recent New Yorker piece that provided an overview of the state of nightmare research. Apparently, certain themes tend to dominate certain historical periods. German dream researcher Michael Schredl found that “bogeyman” dreams were popular in the 1920s; the 1950s and 60s were dominated by ghosts, devils and witches; and in the 1990s, movie villains became central elements of nightmares. 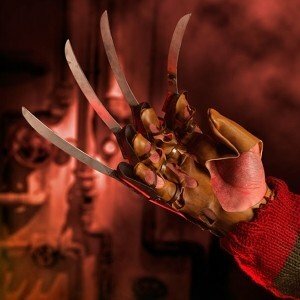 Currently, the chief baddies are Voldemort and Freddy Krueger, who, in the classic movie franchise Nightmare on Elm Street, actually wrecks his knife-fingered havoc inside people’s dreams. Wasn’t it inevitable that he would slice his way into our dreams as well? Current research does not clearly indicate that watching more TV or playing more computer games contributes to having more bad dreams, but children’s nightmares often reflect the imagery they soak up while glued to the tube. British psychoanalyst Susan Budd actually argues that pop culture has not only affected the content of our dreams, but it has also affected their length: dreams tend to be shorter and more fragmented now than they were at the turn of the century. And it is very creepy to hear that there is a strong correlation between whether people report having black and white or color dreams, and their access to black and white or color TV and movies. It’s no wonder that people get so riled up about television and film and its impact on society. Screen images literally worm their way inside our heads and help shape the stories our brains tell ourselves. Only a few comparative international studies of nightmares have been done and they’ve found that there are some elemental themes that appear everywhere. The most popular is a scenario in which the dreamer is being chased or attacked (sound familiar?). Other common themes that emerged from an international study of young adults included being unprepared for a test, being stuck in a dangerous place, being unable to move, being late for something, and having your favorite people die or go missing. I don’t know about you, I’ve had every imaginable version of those bad dreams, and, thirteen years after grad school, I’m still plagued by that stupid test-taking nightmare. What is less known is how nightmarish elements are turned into stories. All of us recount our nightmares as if they were narratives, and this got me thinking about horror films. Cultural critics, psychologists and sociologists have long been curious about why humans appear to be drawn to stories that frighten them. My friends usually express dismay or disappointment when they discover that I spent my adolescence consuming a steady diet of B-horror flicks (I still exchange quotes from Evil Dead 1 and 2 with my high school buddies). I always felt there was something therapeutic about it – not unlike the pleasure that children get from watching violent cartoons. I figured it was a way to manage my anxiety about living in a world where I could get hurt or killed in countless horrible ways. It turns out that children and women have more nightmares than adult men. This may suggest that the more physically vulnerable members of our species have a more urgent need to play out the nastiest scenarios in order to hone our survival instincts. An article in Entertainment Weekly confirmed a long-time suspicion of mine that women may be the primary audience for slasher flicks. Despite the fact that Hollywood claims to jack up the violence for male movies and take it down for chick flicks, the horror genre seems to defy those guidelines. It turns out that The Ring, The Grudge, The Exorcism of Emily Rose, The Texas Chainsaw Massacre andHellraiser were all driven by female moviegoers. As men get older, they stop going to horror films but women keep going back for more. Antti Revonsuo, a Finnish cognitive scientist, argues that dreams operate as “threat simulations.” Evolutionary scientists have long argued that leisure activities and play scenarios serve important survival functions, and I’ve always found their conclusions compelling. I’m reminded of them every time I watch a nature documentary in which young animals practice pouncing, attacking and defending themselves with their siblings and an indulgent adult or two. Practice – both physical and mental – clearly has value. The fact that our “threat simulations” have gravitated to film and TV screens shouldn’t surprise us at all. Let’s just hope they’re actuallyhelping.